I have severe carpal tunnel syndrome and will be having surgery soon, and even the thought of freshly squeezing lemons each day hurts. I also have joint pains and inflammation, which I'm sure daily lemon water would help to alleviate. I can much easier eat the lemon slices and drink plenty of water with them, versus squeezing the lemons each day for their juices. I just don't want to go about this alternative in vain. Please help. Thanks. I believe you would get most of the health benefits of drinking fresh-squeezed lemon juice if you eat lemons along with drinking plenty of clean water at the same time. However, I would not recommend eating lemon slices every day, mainly because the citric acid of undiluted lemon juice can cause the erosion of tooth enamel. Even though many people find that drinking lemon water is highly beneficial for the digestive system, if you or someone else had a pre-existing ulcer, eating lemons are not be such a good idea. So that is just something to be aware of. Another potential issue might arise if you are prone to acid reflux. Even though drinking lemon water can help prevent acid reflux (because it helps to alkalize the body), straight citrus juice may worsen reflux symptoms. So it can go either way. 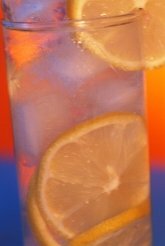 For daily use, I recommend drinking ¼ to ½ lemon in 12 ounces of filtered drinking water rather than eating lemons and drinking water. With your carpal tunnel issues, your best bet is to get someone else to juice the lemons for you. And if you live alone, you might want to invest in the type of blender that pulverizes fruits and vegetables into a smooth texture. My favorite blender of this type is the Nutri Bullet. Making lemon juice with this type of blender is the best! In fact, it is better than just squeezing lemons by hand or with a lemon press because the blender pulverizes the entire fruit, including the white part just below the skin as well as the core of the lemon. The white part of the inner skin and the core are packed with nutrients. We hope these tips help you find a solution!